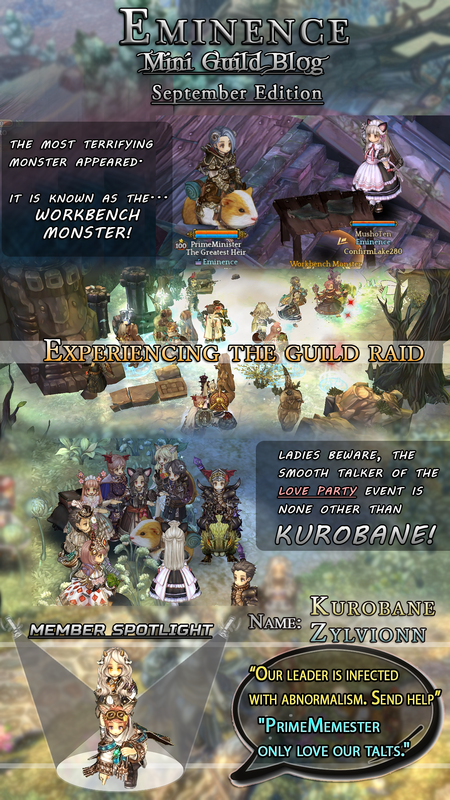 Need to understand a little bit more about what guilds are all about? 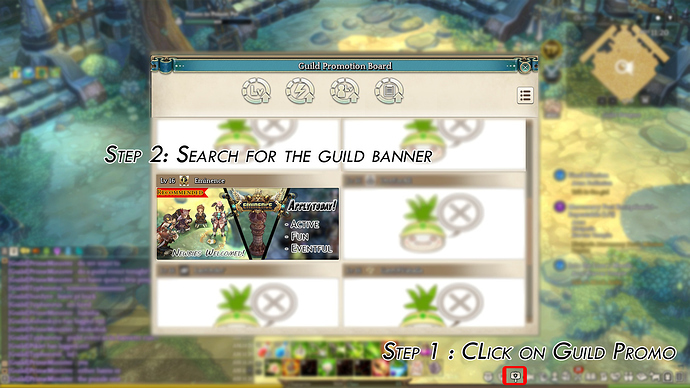 Visit my guide to guilds here. Hello everyone! We’ve revamped this entire guild thread based on the latest patches! 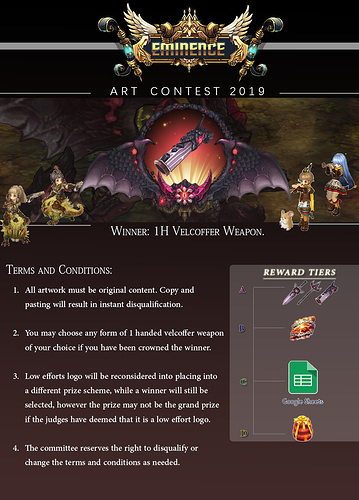 We’ve also edited quite a few requirements inside, feel free to check it out and feel free to ask any questions if you have any! This post will continuously be updated if there are any additional changes. Eminence defines as being successful, and that’s what we plan to achieve. We are a fun group to be and nevertheless active! 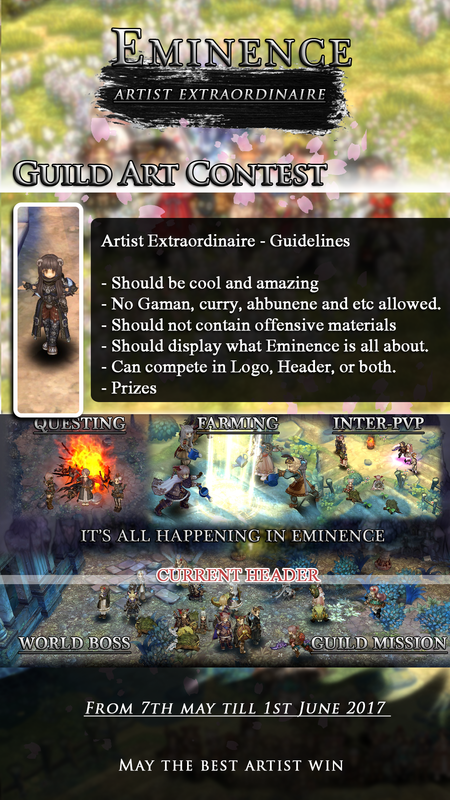 if you were to ask whether Eminence is casual or competitive, i would say we’re in the middle! We’re definitely active enough to be considered competitive but we have much more fun together as a group. We strive on PVE content currently. As of now, We’re gearing up with velcoffer equipments for the guild and ourselves as well! 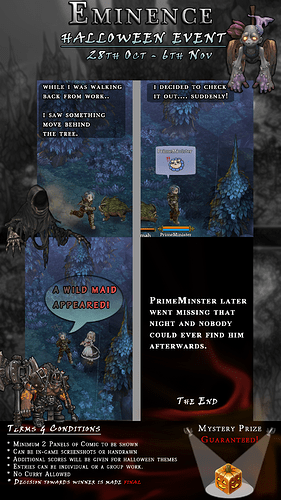 We have tons of custom events that is hosted for the guild (and sometimes the entire server for Telsiai!). so if you’re aiming to have fun, we definitely recommend you to join us here! 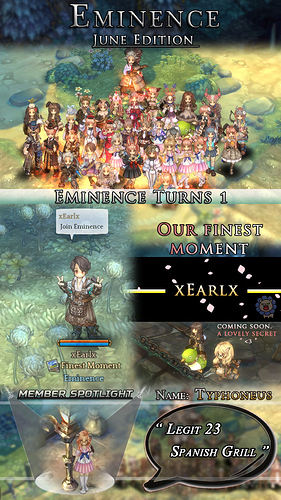 we welcome both newbies and veterans alike, for more information on how we do recruitment, i suggest reading down below on applying to Eminence! 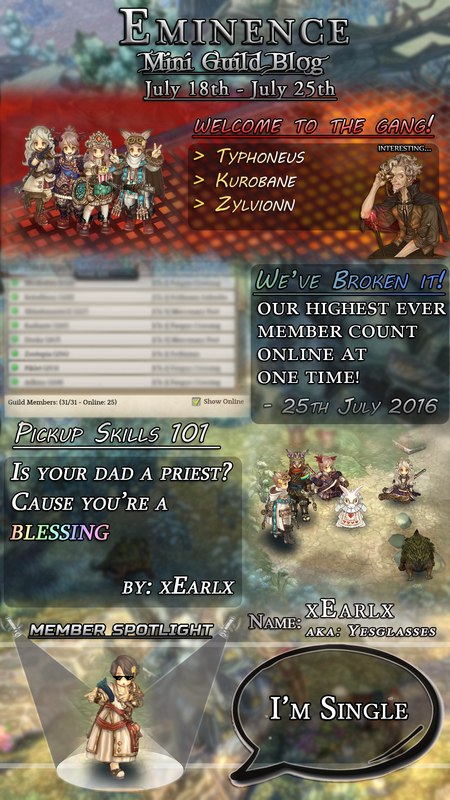 We have a special position for newbies and normal players. 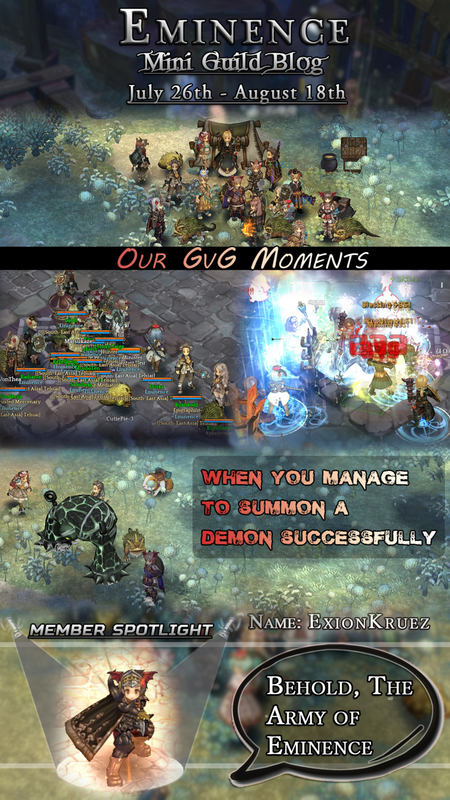 Here’s a short picture to tell you about what are some of the things that we do as a guild together, courtesy created from our very own guild member as part of our art-contest winner! 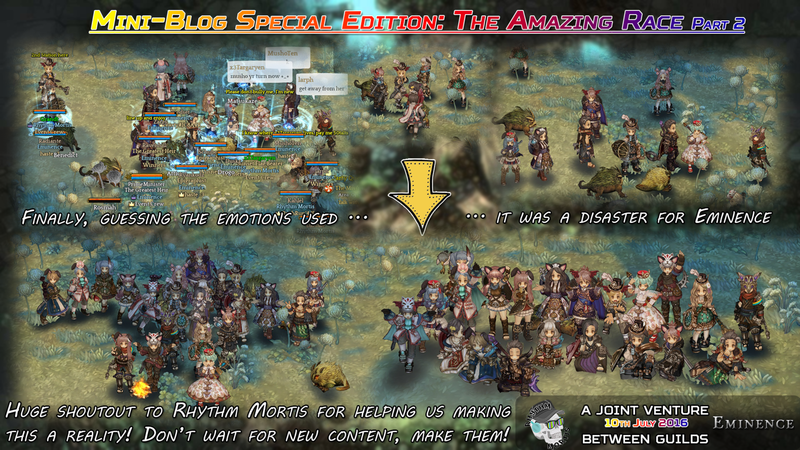 Additionally, i would also highly recommend to check out how we feature some of our members in our mini-blogs located at second post of this topic to show you the events that we’ve hosted before. 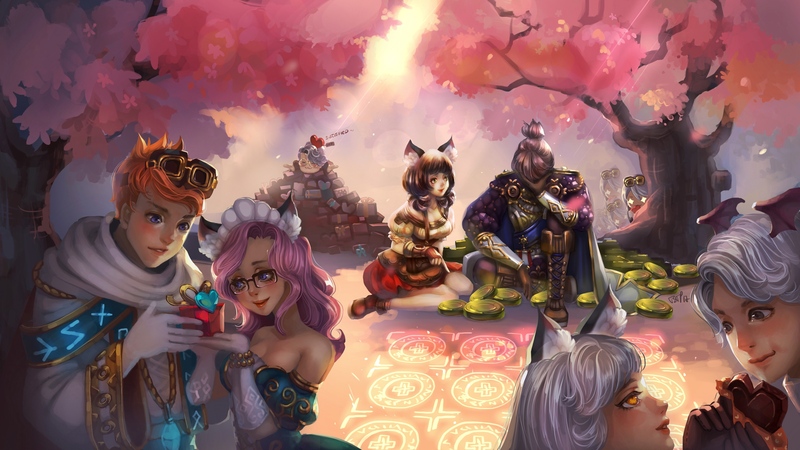 We are very helpful among each other and we definitely do try to help as much as we can, however we do hope that this will influence you to help out the other players once you’ve polished yourself in the guild! I definitely hope to see around soon! 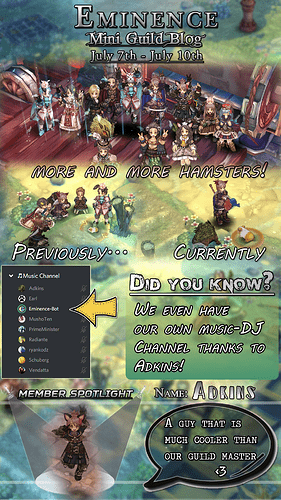 If you have any questions that you’d like to ask about the guild at all, feel free to reach me via discord or in game. 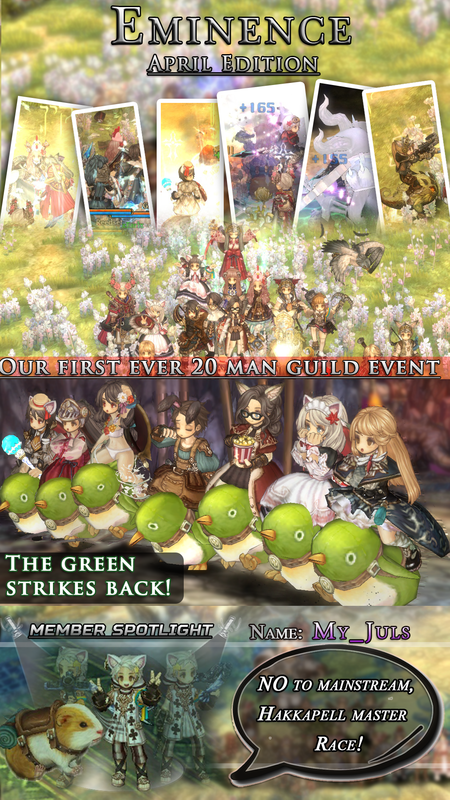 Racism is not allowed within the guild. 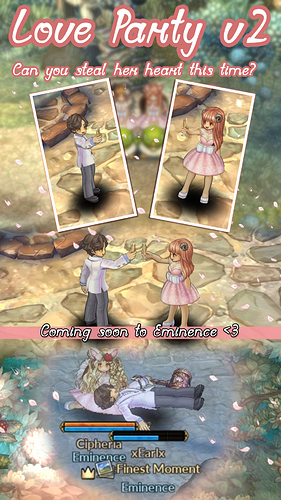 All forms of communication within the guild are to be done in English. Be Helpful among one another. No illegal programs are to be used within Tree of Savior. Active at least once in 3 days. 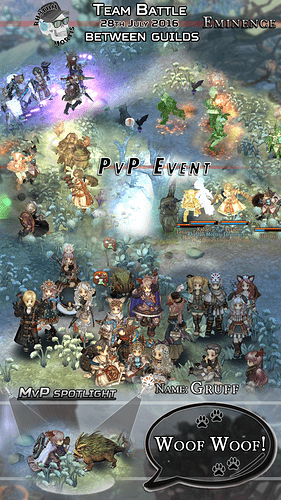 Be active in the guild chat, feel free to ask anything! Contribute to the guild actively. [MANDATORY] Joining us in Discord. Voice chat is not necessary. This is for guild announcements mainly. We prefer if you’re able to be active in discord as we communicate very actively in discord in and outside the game. Additionally, you can also ask for builds there too if you’re not in game! 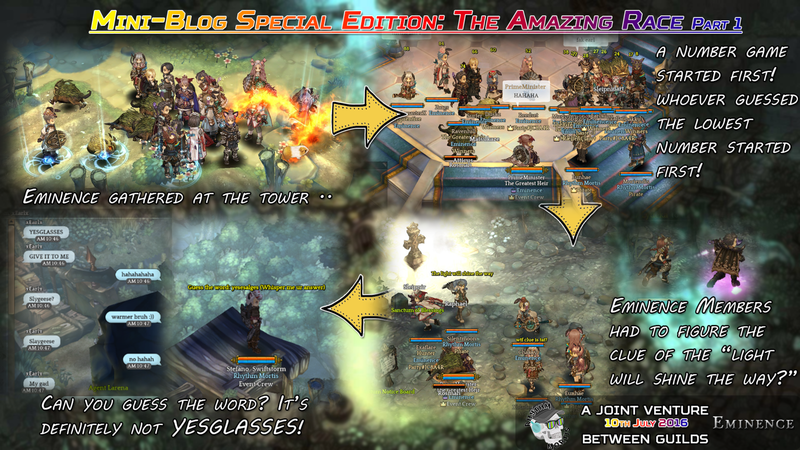 Additionally, many of our guild functions such as Bots, distribution of guild items are all done via discord. If you do have the requirements, feel free to apply down with the following format! Alternatively, you could also apply in game automatically as well! 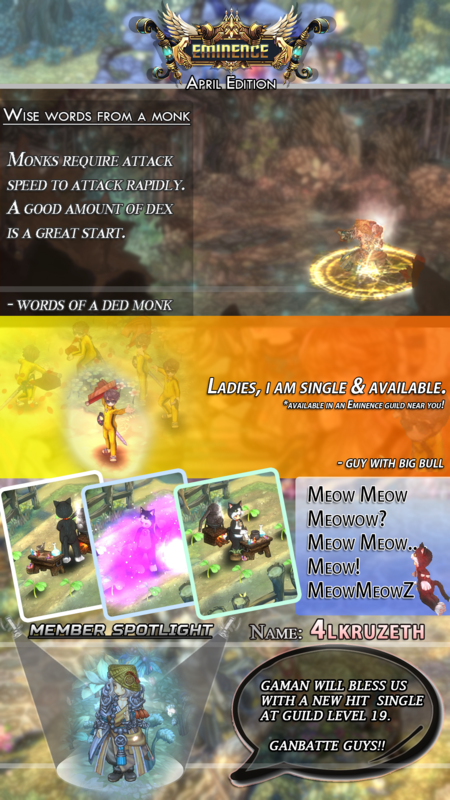 (we check the guild application page on a daily basis. please allow up to 24 hours for us to process your application!). If you’re not sure how to apply check out the information below on how to apply. Feel free to ask any questions if you have! click on the arrow to show the text! Must i donate my talts to the guild upon joining in? As of May 2018, we’ve decided that talt donations are no longer enforced. 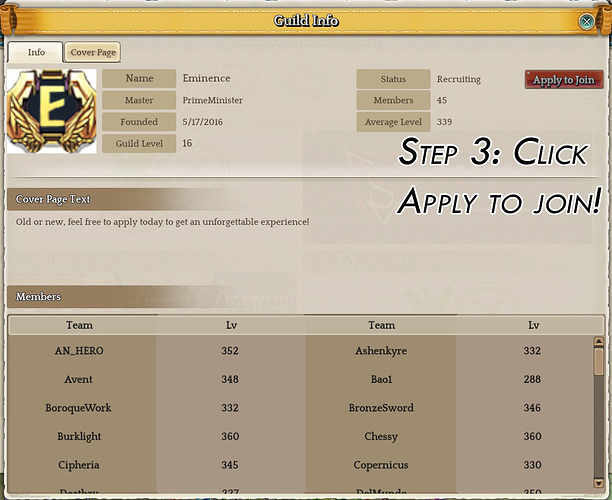 However do note that donating talts will give you points internally which is used to purchase some guild items. 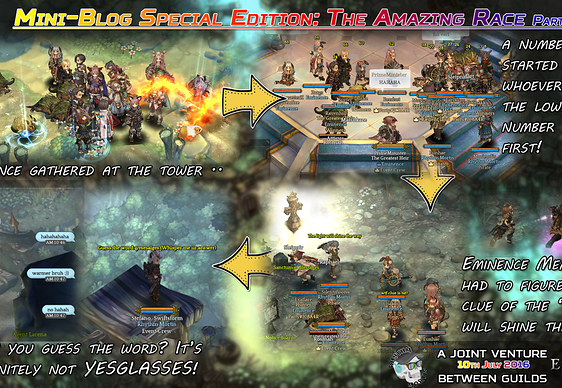 Therefore, the more contribution/donation you’ve helped towards the guild, the more the guild rewards you. I understand that real life activities may occur at unusual timings which does not allow you to be online, in that case, kindly drop us a message at our discord channel where you can place your leave period there. How do i contribute to the guild? 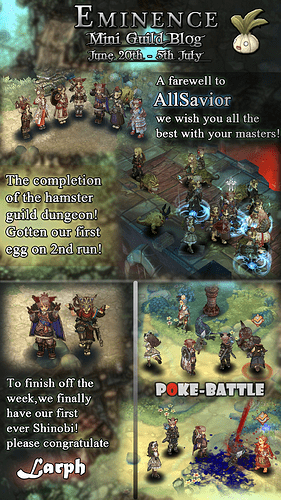 Talts is one method of contributing to the guild, additionally we do have farms that may require someone to tend to and not to mention hamsters! 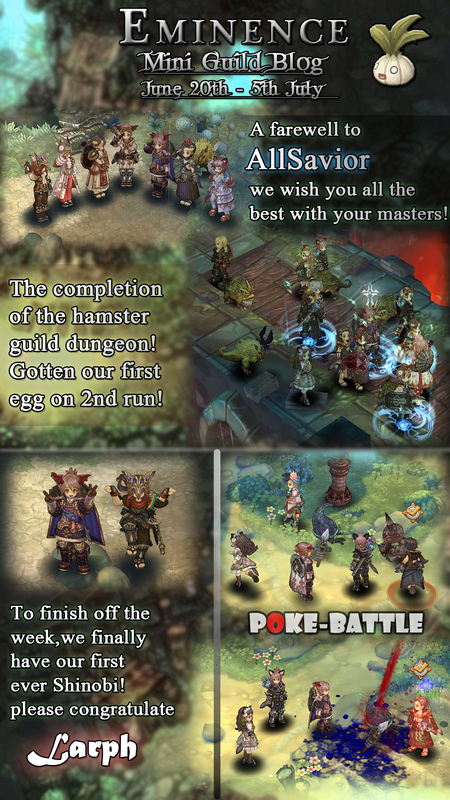 They require feeding from time to time and it’d be great if you could feed the adorable hamsters! aside from this, we’re just hoping you may help someone that might be of lower level from your end if he/she comes asking for assistance. We definitely appreciate if you could communicate in the guild more often so that not only me, but the whole guild knows who you are! I need help, who can I look for? Everyone! We’re here to create a great community for both guildies and non-guildies. As long as you give a shoutout for a help, if it’s within the best of our abilities, we’ll definitely give you a helping hand. The only point to note for is to ensure that you speak up! We won’t know if you need help unless you tell us to! 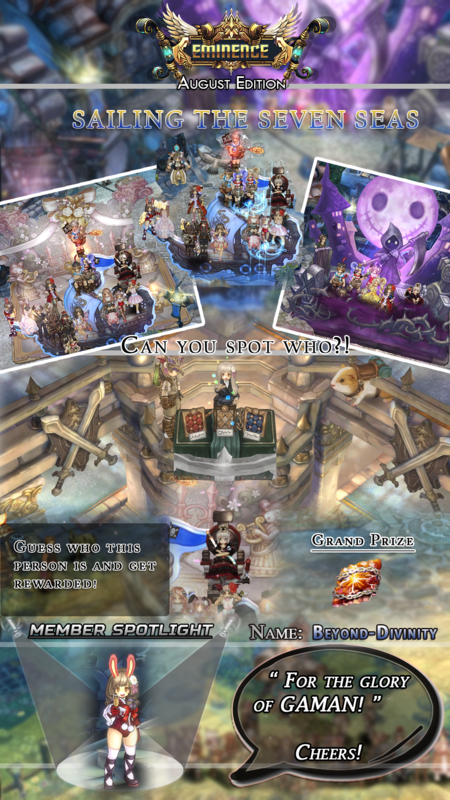 How are you distributing your guild items? Currently we have an in game bidding system where you can bid for all items from guild events. Joining events and donating talts will give you points. We host it similar to an auction where the highest bidder at the end of the duration will get the prize. We highly believe in trading effort vs rewards, therefore the more you contribute to the guild, the more the guild rewards you! Will you be participating GVG/PVP events? 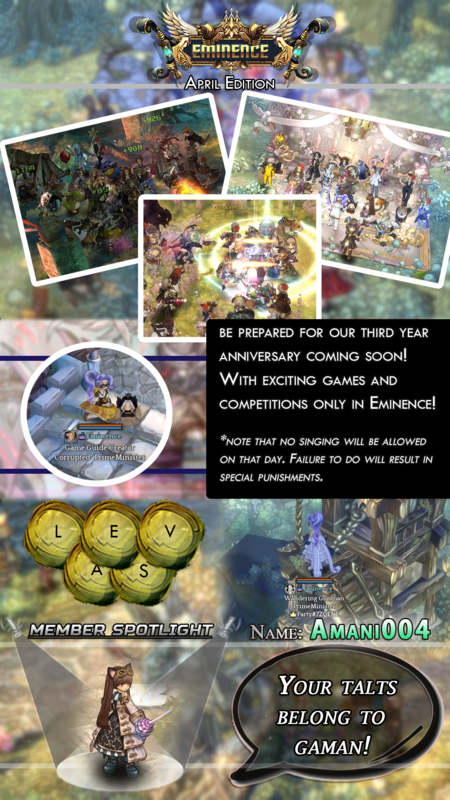 our main focus is on PVE currently. We may occasionally do GVG, however that would be a seperate discussion entirely. Are there any Officers/Vices that will be PMing me in order to join? Please note nobody will ever ask you to give an item or any other fees to join the guild. Ensure that the username that PMed is you is verified. An Amazing Drawing by @ponachan of us in the guild as part of her submission! Check out our mega event that we did on the 21st of January 2017 here! 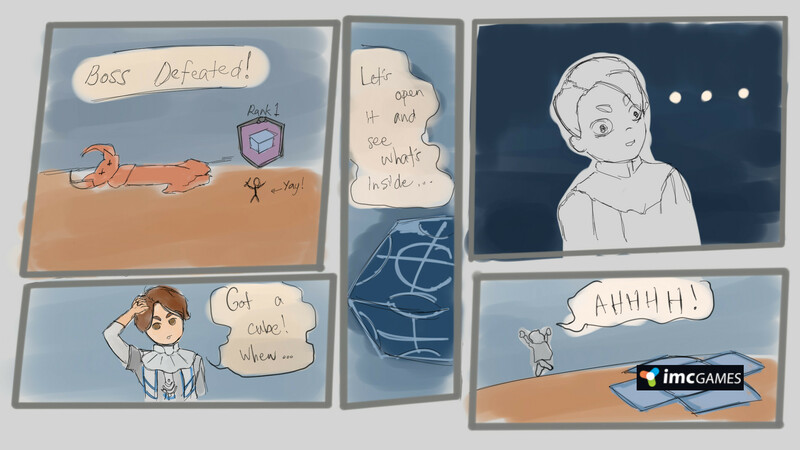 Featuring [GM] Grapes! 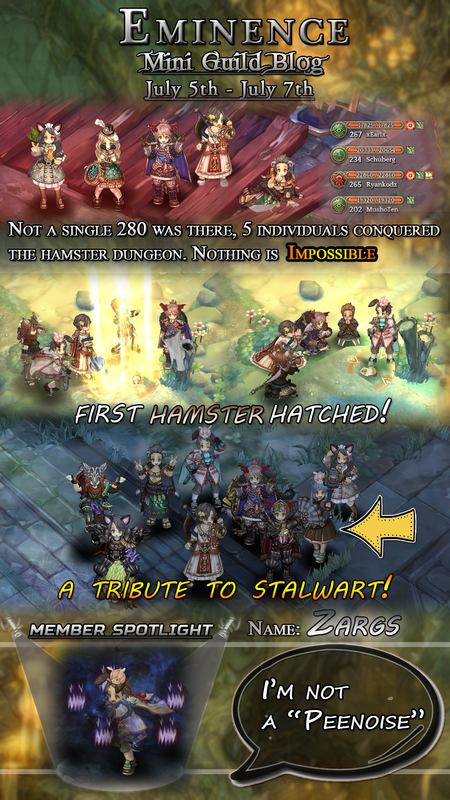 A video by our member Zargs for the Hamster/Guinea Pig Dungeon! Can you solve the puzzle? 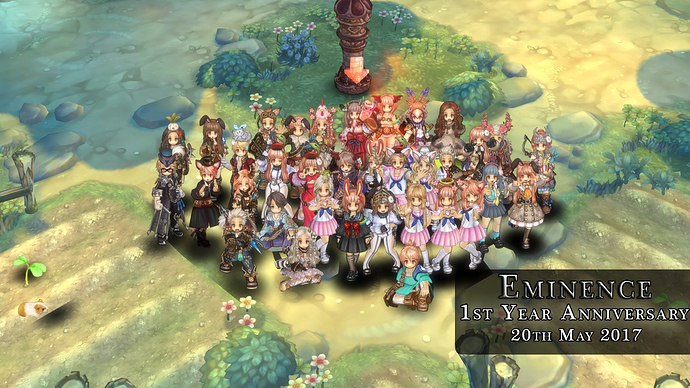 Presented and hand drawn for our 1st year guild anniversary from @ponachan! But wait… don’t forget to scroll down a little bit more to find out our miniblog that tells you what Eminence is all about! 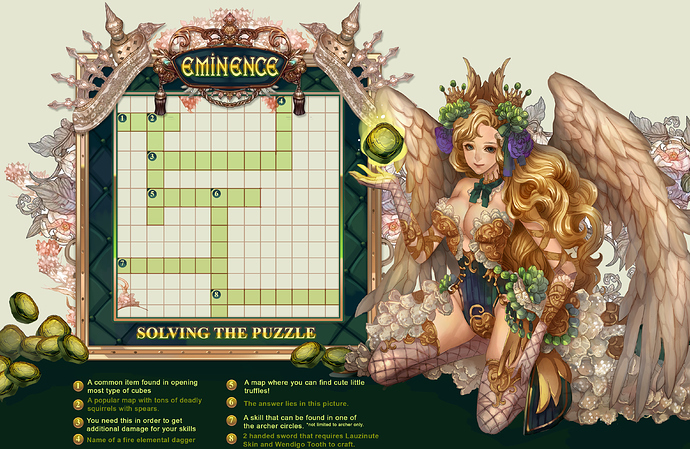 #Check out all Eminence’s Miniblog here! That’s okay and sure i can wait. Thanks! 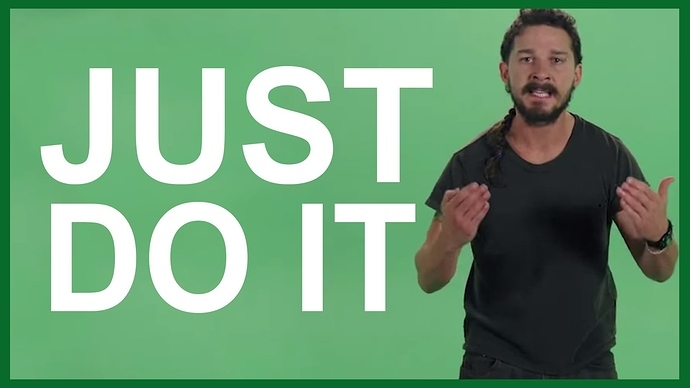 i’ve placed the waiting list publicly so that everyone can see if they wish to wait. as of this post we are 27/27 and the maximum is 35 in case anyone was wondering. 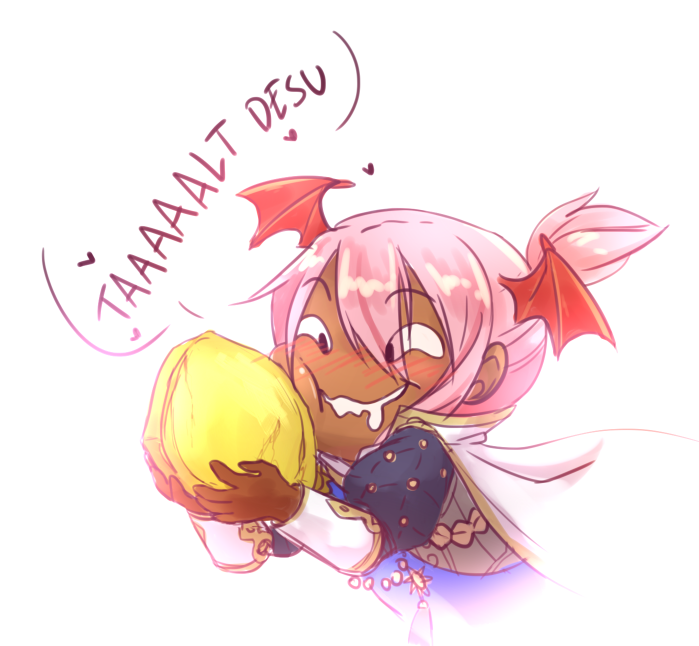 Thank you for your interest in joining 1TOS! 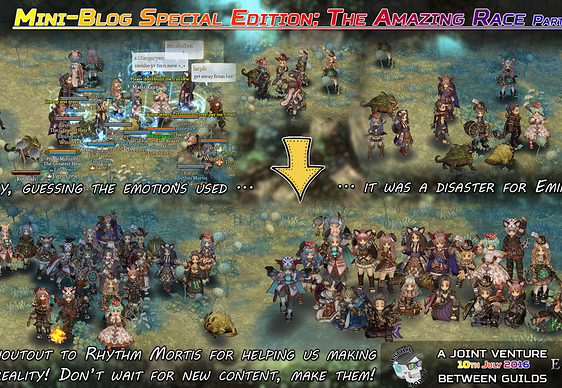 Unfortunately we do not have the slots right now, therefore i’ll be adding your name to the waiting list. Thank you once again! Active period: around 4hours everyday at night? PS : Until the end of the month, I’m very busy because I’m arranging a yearly event on my University And I’m in charge of the event division , thus making my gaming time a bit limited, But at the end of the month I will be free and will be able to play much much more . 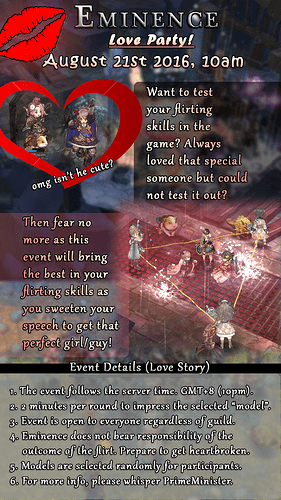 Why you should pick me to join : Becauseee I’m talkativeeeeeeeeeee and it would be fun to have me on the Guild lolol ( Overrating myself xD). 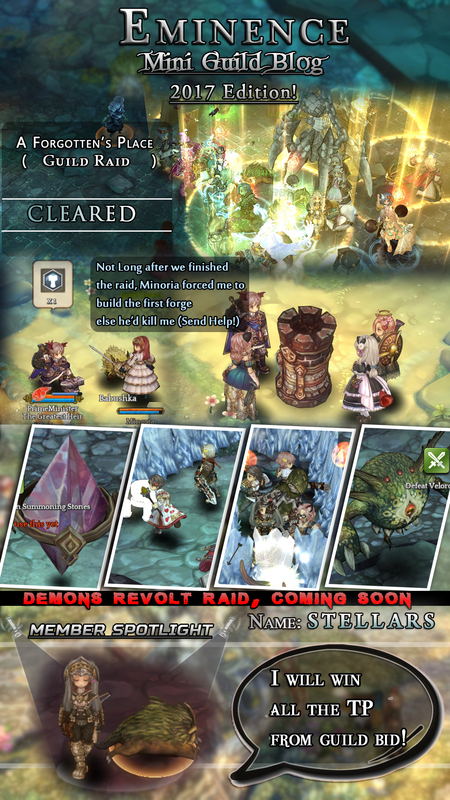 I’m the kind of player that can be very serious depending on the situation (ex: Guild Wars), and I don’t mind throwing out some real life money on donating on our Guild website (If we do have one), and yeah I just love spending real money on Games , because it’s one of the biggest joy for me xD, especially on costumes and accessories. 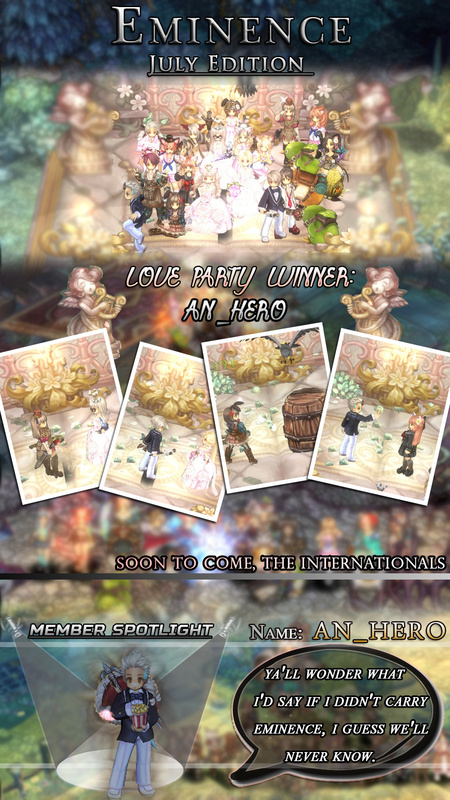 Okay sorry for the long intro, I don’t mind waiting on the waiting list if the Guild is full, would really love to join you guys Good Luck to you all. Thank you for your interest in 1TOS! It’s great that you’re a full support class cause that might be what we actually need at the moment haha. As usual, i’ll place you on the waiting list for the moment! Thank you once again! Great to know that you’re really active and great write up! 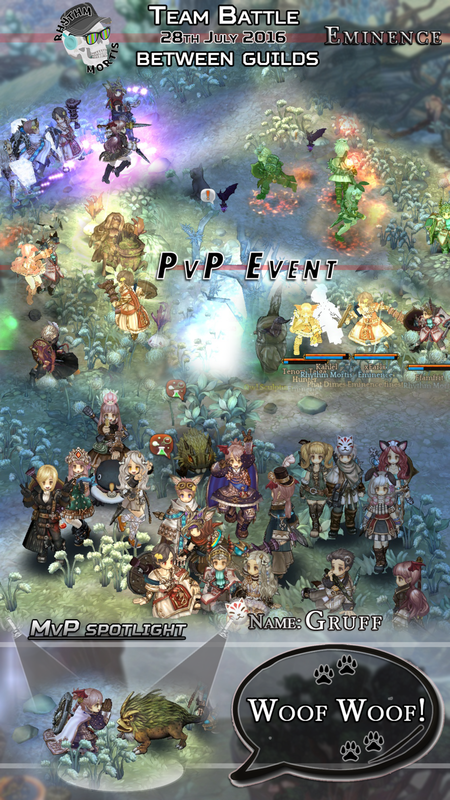 We really want people to be noisy in our guild cause that’s what a game is all about! Making new friends! 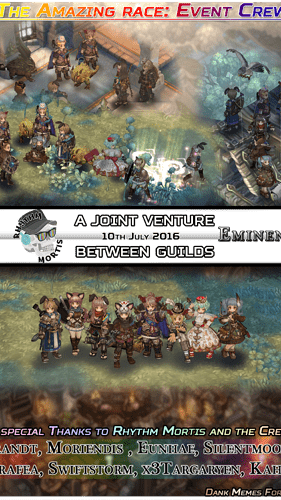 We do not have a guild website at the moment however we’re thinking of making either our own forums or perhaps a facebook page. We are currently still evaluating this at the moment and of course, we’ll place you on the waiting list for now, can’t wait for you to join us! Why you should pick me to join: I like being in a community where people help each other and game more enjoyable if you’re playing with a group of people who are having fun together. Futhermore im looking for a softcore guild ATM. please note that we have been affected by the /destroyguild command and i’m currently seeking aid from IMC to recover this as soon as possible. With this i regret to inform that there will be delays further in joining in. Once again, thank you for your interest in 1TOS. for existing members, i will re-create the guild once i get a clear direction from IMC. if they do not respond, i’ll re-create it by tomorrow. Hello, please recruit Yours truly. Active Period: Yours truly is a man. So, I get no periods. Thank you very much. I really hope IMC will do something about this quickly as it is fairly difficult to communicate one another without a guild. otherwise we won’t let this bring us down, we’ll recreate the entire guild and make it even better than before. 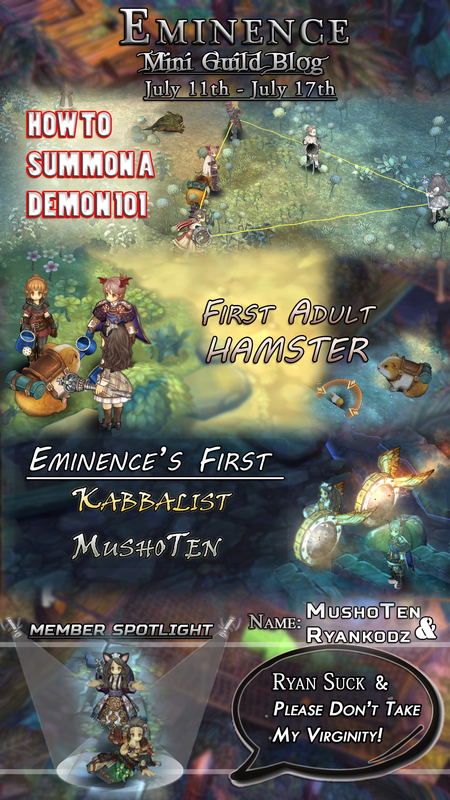 I would like to announce the re-branding of 1TOS into Eminence! Due to the bug that had destroyed our guild, we face yet another issue of 1TOS being used. 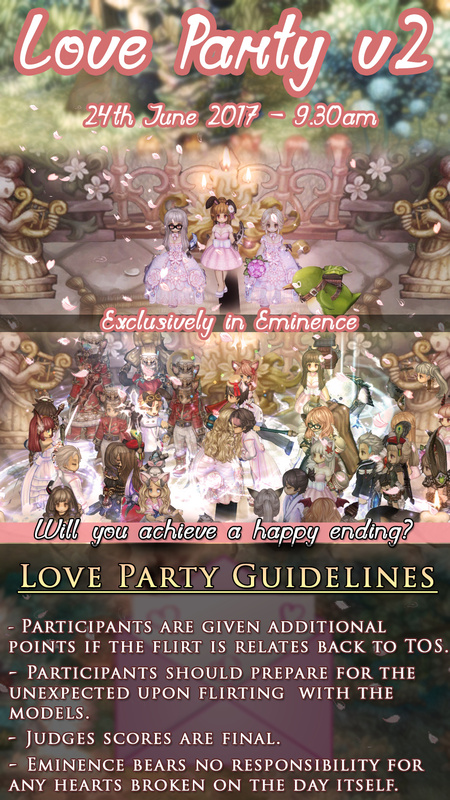 Therefore, we have decided to use Eminence instead. Why Eminence? 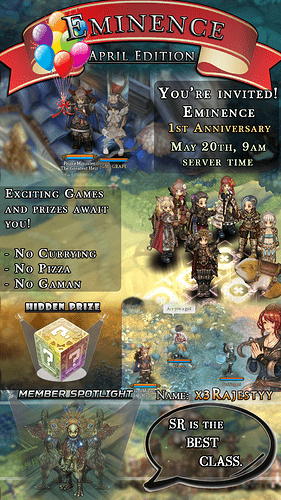 I have re-edited the entire guild page to include new details as to why we’ve chosen Eminence. Don’t worry though! 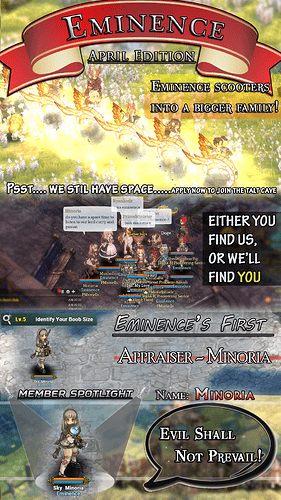 We’re still the same fun guild to be! However much work is needed in order to get back where we were before. We hope that you still put your interest in Eminence! For Existing members from 1TOS who have not joined Eminence, please message me within 3 days in order to get an invite either from here or in-game, if you fail to do so, we will proceed to give your slot to other members. Edit: feel free to comment anything about Eminence if you have any.